I called the vinaigrette I used for this salad ‘French’ Dressing as it’s meant to be like the restaurant staple French Dressing of my youth. This is better – even though it uses ketchup. Since the tomato flavor I was looking for is required in such a small quantity, ketchup seemed the logical choice. Don’t knock it ’til you try it…. Whisk ketchup, vinegar and mustard. 5 minutes before serving salad, bake for 4 – 5 minutes at 400F (200C). 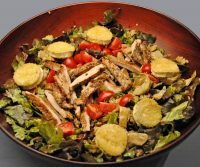 Cook turkey on barbecue grill or sauté in nonstick skillet until done, 4 – 7 minutes per side, depending on thickness. Add half of the dressing to the lettuce and toss well to coat. Add 1 tbs dressing to quinoa, then add to lettuce. 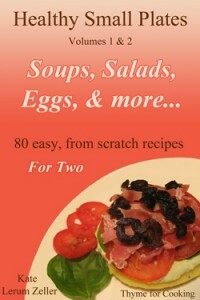 Arrange artichoke hearts and cherry tomatoes next to turkey. Serve, remaining dressing on the side. 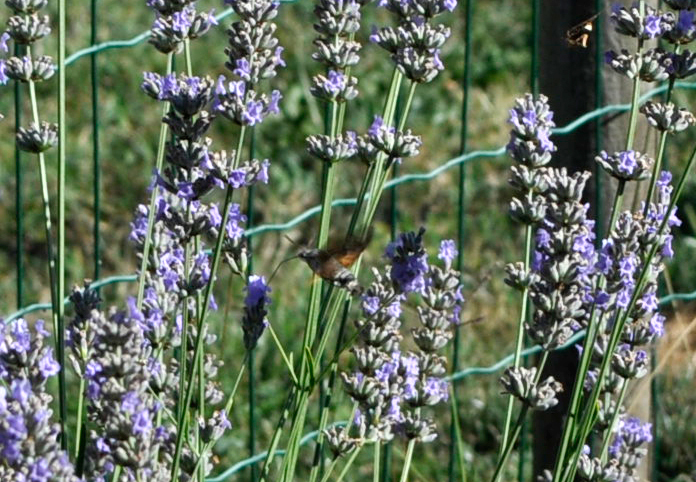 I was watering the herbs along the fence yesterday morning and spotted a hummingbird hawk-moth. The first time I saw one, when we lived in Andorra, I just assumed it was a hummingbird. 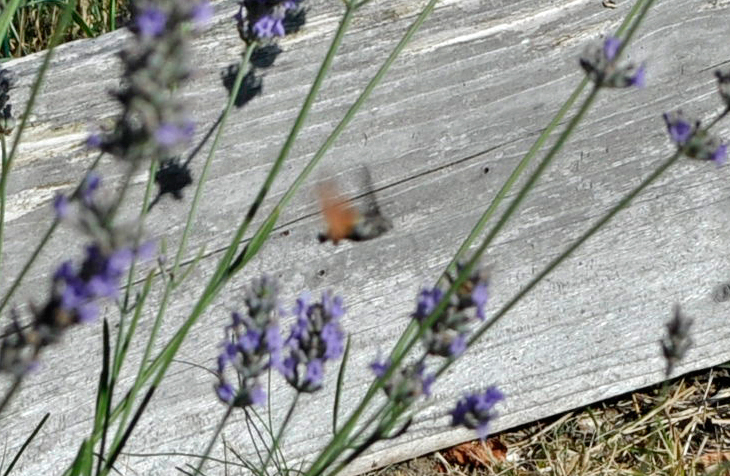 Then our friend from Spain, who collected and cataloged moths and butterflies in the Pyrenees, told me it was a moth. He told me that there are no hummingbirds in Europe, which was why he was planning a trip to Costa Rica to see them. Since he was always right about everything (really, he was… rather annoying at times), I believed him. I don’t really have the right lens for taking photos of hummingbirds – or hummingbird hawk-moths, but here they are, anyway. You can see why I thought it was a hummingbird…. Apparently they really like lavender. 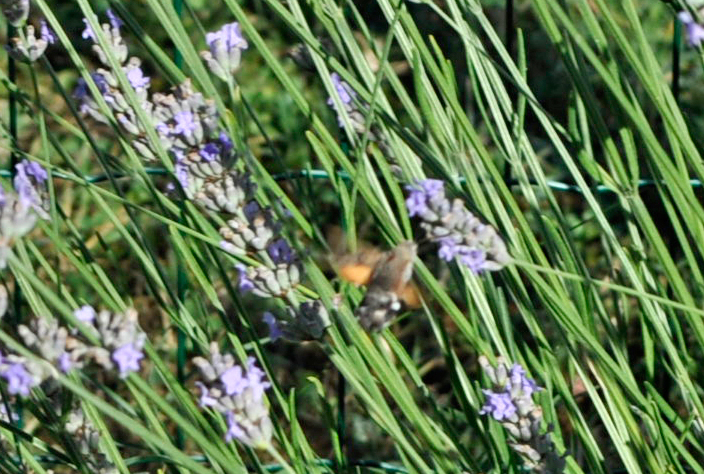 I have a hummingbird moth that visits my madavilla on a daily basis. They really do look like teeny tiny birds. They also like petunias – we see them regularly around the hanging baskets. It is definitely salad weather at present. I only ever see one…. but then I’m not out by the fence watching lol Hot, hot, hot….. I do have hummers, several, that I feed. While we do have some similar species of your moths here, I’ve never seen one. I’m still waiting for the tomatoes to ripen. I’m harvesting cukes and peppers like mad, but the tomatoes are taking forever! My mother had a hummingbird feeder outside her kitchen window and had lots of them. Amazing to see that moth or bird…nothing like that in Morocco or Australia !!!! They are amazing creatures….. Maybe next time your here.